Saturn's moon Enceladus, imaged by the Cassini probe in 2015. A space mission that could hunt for definitive signs of life on Saturn's moon Enceladus looks even more enticing following the release of new evidence that a habitable environment lies under the surface of this icy world. The surface of Enceladus consists of a solid ice layer that is estimated to have an average thickness of 11 to 14 miles (18 to 22 kilometers), and that covers a massive, liquid-water ocean. The new study indicates that the floor of Enceladus' ocean likely features hot water vents, similar to the ones that host lush ecosystems at the bottom of Earth's oceans. The alien ocean also features a type of molecule frequently used as a food supply by life-forms on Earth, the study said. Cable is part of a team of scientists putting together a proposal for a mission designed specifically to look for signs of life in Enceladus' plumes. 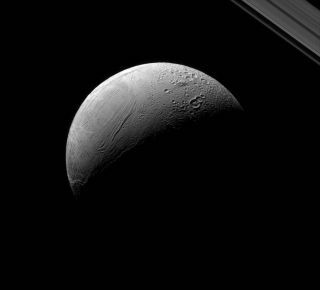 The Enceladus Life Finder (ELF) proposal will be submitted to NASA later this month, along with other proposals that the agency will consider for its next New Frontiers planetary science mission. Previous missions in the New Frontiers program have included the Juno probe to Jupiter and the Osiris-Rex mission that will return a sample of an asteroid to Earth. The Cassini probe, designed to study the entire Saturnian system, has flown through Enceladus' geyser plume seven times. Its most recent pass through the plume, in October 2015, is the subject of the new research paper. Cassini detected molecular hydrogen (H2), which the authors of the new paper think formed through interactions between hot water and rock. This supports the idea that the floor of Enceladus' ocean hosts hot-water geysers like those found on the bottom of Earth's ocean, the researchers said. This artist's illustration depicts the possible interior of Saturn's moon Enceladus, based on observations by the Cassini probe. Molecular hydrogen is also an ideal food source for many microbes and bacteria, NASA scientists said in a statement. Breaking apart the two hydrogen atoms releases energy stored in the bond between them, like a veritable energy piñata. Molecular hydrogen bonds are particularly easy to break, so their energy content is readily available to many life-forms. "Combined with our knowledge that there's an ocean under Enceladus, that it's salty, that it contains organics and mineral interactions — these are all other discoveries that Cassini has made — when you put that on top of this, it really completes the case for the ocean being habitable or being able to sustain life," Jonathan Lunine, a professor of physical sciences at Cornell University in New York and one of the co-authors on the paper announcing the new discovery, told Space.com. "'Cassini was not designed to be a seafaring mission,'" Cable said, quoting Linda Spilker, current project scientist for the Cassini mission as well as the project scientist for the ELF mission concept. "We had no idea that the plume of Enceladus existed back then," Cable said. "Now … we have a much better idea of what instruments we should bring to be able to taste those key molecules present in the plume, to better understand habitability and to look for life." ELF would look for life first by detecting molecules that are formed by biological processes, and then by comparing the ratios of those different molecules, Cable said. Those ratios are different when life is present, she said. NASA may have a second opportunity to sample a plume from an icy world. New results from the Hubble Space Telescope suggest that Jupiter's moon Europa may also be periodically spewing plumes of water into space from its subsurface ocean. Signs of the plumes have been spotted for a second time by Hubble, but the scientists behind the result said they were still hesitant to declare a definitive discovery. NASA's Europa Clipper mission is set to launch in the early to mid-2020s and study the icy moon from orbit. It's possible the probe could sample Europa's plumes (if they exist), agency officials said. That scientists do not need a lander to search for life on Enceladus, and perhaps on Europa, is a major draw of sending dedicated missions to those places, said Lunine, who is also principal investigator on the ELF mission concept. "We don't have to build a mission to land [on Enceladus], to drill, to melt [the ice]," he said. "The next mission should fly through the plume repeatedly with modern mass spectrometers. With that [mission], we can test for the molecular signatures of life. And we can do it for an amount of money that is much, much less than [the cost of] Cassini." The price cap on proposals to the NASA New Frontiers mission is $850 million, not including the cost of launch and operations. (For comparison, Cassini's price tag is about $3.2 billion.) ELF was previously submitted to NASA's Discovery mission program, which has a lower cost cap. Cable said at least one other team is expected to submit a proposal for an Enceladus mission to the NASA New Frontiers call for proposals. "Enceladus is … spewing free samples into space. All we have to do is fly by and get it," Cable said. "These opportunities don't come along every day. If we are able, just by tasting some key molecules in that plume, to definitively say that we are not alone, I think that kind of revolutionary discovery is worth $850 million."